For our endangered species of the week, I’m rerunning an earlier post about a very “Halloweeny” species – the Kauai Cave wolf spider! So read through and then learn 7 facts about spiders that you might not have known! The Kauai Cave wolf spider (Adelocosa anops), also known as pe’e pe’e maka ‘ole in Hawaiian (from Earth’s Endangered Creatures) is found in only three caves on the Hawaiian island of Kauai. Like other wolf spiders, the Kauai Cave wolf spider doesn’t build a web to capture prey; it relies on speed and chases down its prey. Like all other spiders, it is venomous; it has three teeth for biting it’s prey. What’s really amazing about this hunting style is the fact that these spiders don’t have eyes (from Arkive)! According to the U.S. Fish and Wildlife Service Species Action Plan, the main threats to the spider are alteration of the caves and surrounding vegetation, non-native predators, and pesticide run-off. What on earth is a “code red” day? Hurricane Sandy's getting ready to hit, but a code red day isn't a day that starts with "red sky in the morning, sailors take warning." And i t’s not a day that starts with a beautiful red sunrise for a balloon launch! As we’ve discussed in previous posts about asthma, air pollution has significant impacts on our health, as well as on our environment (think climate change). The U.S. EPA, in cooperation with the Sacramento Metropolitan, El Dorado, Feather River, Placer, and Yolo-Solano Air Districts, has developed a great tool for learning about the sources of air pollution in your community and that pollution’s impacts. Smog City 2 lets players set various levels of pollutants and population, as well as weather conditions, in order to see the impacts of various inputs. You can take a close look at particulate pollution and ozone impacts – now you’ll really understand the meaning behind those “code red” days! After you’ve learned about the impacts of air pollution, check out this energy profiler from U.S. EPA to determine how your local utility provides most of your power. Got Pucks? The NHL is going green! I’m a greenmomster, but I’m also a hockey mom. Often, as I’m standing next to a rink, freezing my toes off, my mind wanders to the amount of energy used to freeze the rink, the gas needed to run the zambonis, and the landfill space needed to dispose of everyone’s garbage. It seems that someone at the NHL has been wondering the same thing. They’ve formed a partnership with the Natural Resources Defense Council (NRDC) to make hockey a more sustainable enterprise. The league seems to be very focused on reduce, reuse, and recycle – definitely a step in the right direction. There’s also the Gallons for Goals project. As stated in their green platform, many NHL players learned to skate on outdoor rinks and ponds, and these frozen areas are becoming less common. Hockey depends on cold weather, so the NHL is getting involved. Check out their NHL Green website and NHL Green blog. So what about the other popular, albeit less exciting, professional and college sports? Well the NRDC has discovered that professional sports can have a major impact on the environment and environmental attitudes of sports fans. As the NRDC states on their sports website, “The benefits for both professional and college sports leagues are robust, from saving thousands of dollars on energy, waste, and water bills to creating new sponsorship opportunities and enhancing brand value with corporate social responsibility--not to mention the environmental benefits.” NRDC provides greening advisors to all teams in professional baseball, basketball, hockey, soccer, and tennis. NRDC provides energy, waste, and water efficiency audits for stadiums and arenas, resulting in significant cost and energy savings. An example from NRDC’s blog: “Since first partnering with NRDC in 2008, each year the US Open has recycled 18,000 tennis ball cans and replaced 2.4 million virgin fiber-based napkins with 90% post-consumer recycled content napkins, along with many other initiatives.” Not too shabby! So hockey, soccer, tennis, and baseball greenmomsters, there is hope! We can have sustainability and sports too! Want more information? Read Game Changer, How the Sports Industry is Saving the Environment from NRDC. Be sure to “like” greenmomster on facebook to get all the latest updates! National Hockey League. 2012. http://www.nhl.com/ice/eventhome.htm?location=/nhlgreen. ND. Accessed 10/23/2012. Natural Resources Defense Council. 2012. http://www.nrdc.org/greenbusiness/guides/sports/default.asp. ND. Accessed 10/23/2012. NRDC is the nation's most effective environmental action organization. NRDC uses law, science, and the support of 1.3 million members and online activists to protect the planet's wildlife and wild places and to ensure a safe and healthy environment for all living things. NRDC's website provides a wealth of environmental information as well as state-of-the-art online activism tools. This week’s recipe is a vegetarian version of an old favorite – super easy too! Maybe use it as a quick meal before Halloween. Enjoy! 1) Heat oil in a skillet. Saute onion and peppers until onion is almost transparent. Add fake ham. 2) Add the cans of blackeye peas, including liquid from one can. Add salt to taste. Heat mixture thoroughly. 3) Serve over rice and top with salsa and sour cream. Woody Woodpecker? Nope, this is a bird of a different feather! Be sure to "like" greenmomster on facebook to get all of the latest updates! This week’s endangered species is the red-cockaded woodpecker (Picoides borealis) (photo from Michael McCloy, U.S. FWS Website). Found in 11 states (AL, AR, FL, GA, LA, NC, MS, OK, SC, VA, and TX) red-cockaded woodpeckers are endemic to the U.S (check out this cool interactive map of where the woodpeckers are found). These medium-sized woodpeckers (about 7 inches long) nest in live, old-growth pine forests, where they hollow out a cavity in which to nest and eat the insects found on the tree. When they hollow out the nest cavity, the tree seeps pitch or gum out of its wood around the cavity hole, that helps to protect the nest from tree-climbing snakes – so cool! Red-cockaded woodpeckers live in “family” groups, usually with one breeding pair and several helpers. The helpers are usually males from previous breeding seasons (daughters tend to disperse to new groups). The family group hollows out several nesting cavities, and the breeding male chooses the cavity in which to raise 2-5 chicks. Here’s another fun fact – the males incubate the eggs at night! The woodpeckers sound very similar to other woodpeckers you might have heard. Red-cockaded woodpeckers are currently threatened by habitat loss. The good news is that these birds are benefitting from their protection under the Endangered Species Act. As stated in the U.S. Fish and Wildlife Service website, “Red-cockaded woodpeckers have increased in number range-wide in response to recovery and management programs, from an estimated 4,694 active clusters in 1993 to 6,105 in 2006. Management plans have been developed for federal and state agencies with recovery populations. On private lands, more than 40 percent of the known red-cockaded woodpeckers are benefiting from management approved by the Service through Memorandum of Agreements, Safe Harbor Agreements, and Habitat Conservation Plans.” Great news on the endangered species front! Cornell Lab of Ornithology. 2012. All About Birds website. http://www.allaboutbirds.org/guide/Red-cockaded_Woodpecker/id. Accessed 10/19/2012. U.S. Fish and Wildlife Service. 2012. Red-cockaded woodpecker recovery website. http://www.fws.gov/rcwrecovery/. Accessed 10/19/2012. U.S. Fish and Wildlife Service. 2012. Species Profile. http://ecos.fws.gov/speciesProfile/profile/speciesProfile.action?spcode=B04F. Accessed 10/19/2012. OK, maybe it’s not frigid yet, but if you’re a warm-weather-lovin’ greenmomster like me, you’ve already pulled out a few sweaters and blankets and turned on a little heat. As we get ready for winter, here’s a helpful video from the Chesapeake Bay Program on how to de-ice sidewalks when things start to freeze. And if you’re looking for a little inspirational art, as you weather-strip your doors and windows, check out these great conservation posters (except the coal ones…) from WWII. Be sure to "like" greenmomster on facebook, so that you never miss a Meat-Free Friday! Since it’s fall, that means we’ve got a bumper crop of apples! Here’s something new to try with them – appleslaw! Use this recipe (which I’ve adapted from a kraft.com recipe ) as a sidedish to go with some veggie burgers and some Terra Spiced Sweet Potato Chips (my new favorite), and you’ve got a quick and easy Friday night meal before the football game! 1) Combine apples, spring onions, celery, and zucchini in a large bowl. 2) Mix mayonnaise with curry powder. 3) Toss apple mixture with mayonnaise mixture. Sprinkle almonds in and toss again. 4) Ideally refrigerate for a few hours for best taste (but I’ve been know to serve it right away). To answer that question, watch this video of a rescue of a baby elephant from a well: http://video.today.msnbc.msn.com/today/49467583#49467583. Elephants are fascinating, complex creatures that are currently threatened by ivory poaching. To learn more about elephants, be sure to read greenmomster's "endangered species of the week" post about elephants, or visit the link (at left) to find out how you can support elephant conservation. The Non-Toxic Avenger by Deanna Duke (aka Crunchy Chicken blogger) – As I wrote in an earlier book review, this book follows the fascinating story of one woman’s attempt to find out how significant our exposure is to “everyday” toxins. Spurred on by her husband’s diagnosis with multiple myeloma and her son’s diagnosis with Asperger’s syndrome, Deanna Duke decided to take a look at toxins and determine whether it’s possible, or even desirable, to remove every toxin exposure from one’s everyday life. Tox Town! This interactive program, sponsored by the National Library of Medicine, is a fun and easy way to investigate which toxic chemicals you might encounter in your everyday life. From school buses to cars, homes to schools, Americans encounter chemical substances everyday. How do we know which are harmless and which are harmful? This program provides information on different chemicals and their locations, so that citizens (both kids and adults) can make educated decisions about chemical exposure (thanks for the link TJ!). In honor of Silent Spring’s anniversary, take a few minutes to learn about toxins in your world. Be sure to “like” our Facebook page for all the latest greenmomster updates! Is your dog longing for company, and lot of it? Like wolves, African wild dogs live and hunt in packs of 6 to 20 dogs. Is your dog monogamous or more of a free-love fan? In the pack, only the dominant male and female breed. Got puppies? Female wild dogs can have litters of up to 20 pups! Does your dog seem restless? Packs of wild dogs can roam over a range of up to 900 square miles! Rather than reinvent the wheel, I’m linking you to the Arkive blog for lots of great details about this fascinating animal (seems great minds were thinking alike this week). If you’re interested in helping conserve and protect the wild dog, be sure to visit the African Wild Dog Conservancy website. 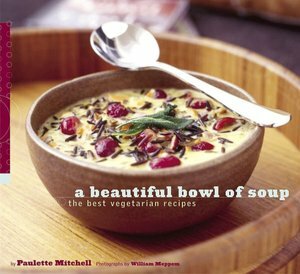 If you haven’t yet discovered the vegetarian cookbook A Beautiful Bowl of Soup by Paulette Mitchell, you’re really missing out. This week’s recipe (I usually double it for a family of five) is one of my favorites from this book – a perfect dinner for a cool fall evening. Be sure to "like" greenmomster on facebook for all the latest updates! 1) Melt the butter in a large pot. Add carrot, celery and onion, cooking until carrot is tender. 2) Add the flour and stir until smooth. Add the vegetable stock, whisking constantly to prevent lumps. Cook until the mixture starts to thicken. 3) Stir in rice and cranberries. Simmer until cranberries are plump. 4) Stir in milk, sherry, salt and pepper. Your chain of command – DOD has stated very clearly that climate change is an issue of concern to the military. A recent report by the Defense Science Board Task Force outlined recommended steps that DOD and other federal agencies should take to address climate change and its global impacts. The report “recognizes that changes already underway are having, and will continue to have, major consequences for the political, economic, and geographic world as we know it.” The report included a special focus on Africa and stated that DOD needs a strong climate change information database, a government-wide approach to mitigating climate change impacts, and engagement with international leaders to work toward a global solution. Climate refugees – Several recent reports (Stern 2006; Bierman and Boas 2010; UN website ) have estimated that by 2050 100-200 million people worldwide could be displaced due to direct effects of climate change (flooding). Most of the refugees will come from Asia and Africa. As these people move, they will need to find new homes. Often, our military is called upon to provide peace-keeping activities during these types of events. Climate conflict – Not everyone will move on from flooding in a peaceful way. Additionally, the secondary effects of climate change include drought, inland flooding, and storms which could affect food supplies. Countries often go to war when resources get tight. Taxes – The military pays taxes too! As we see more “weird weather” throughout the U.S., we’ll also see more people whose homes and towns were destroyed by floods, hurricanes, and tornadoes. We’ve already seen lower lobster harvests in Maine (due to higher sea temperatures),and lower water levels in Lake Erie leading to altered port and shore infrastucture. These adjustments and rebuilds cost money, lots of money. “But hey, so does stopping climate change!” you say. Well, I’d rather have my tax dollars go toward proactive change that could prevent problems down the road, as opposed to spending millions to close the barn door after the horse is gone. (Take a look at the Chesapeake Bay Foundation’s report regarding jobs and environmental protection, too). Climate change is real; it’s happening. And frankly, our military personnel will be some of the first folks to deal with the results. Need a quick primer on climate change? Check out the series of videos on the topic, “Don’t Just Sit There, Do Something.” Here’s the latest edition The others can be found at www.facebook.org/greenmomster. Now is the time for military personnel, and those who love them, to get educated and get active to slow the effects of climate change! Be sure to "like" greenmomster on facebook for the latest updates. Biello, D. 2009. “Can Climate Change Cause Conflict? Recent History Suggests So” in Scientific American, November 23, 2009. Accessed online 10/8/2012. Bierman, F. and I. Boas. 2010. Preparing for a Warmer World: Towards a Global Governance System to Protect Climate Refugees. Global Environmental Politics. Feb2010, Vol. 10 Issue 1, p60-88, 29p, 1 Chart. Defense Science Board Task Force. 2011. Trends and Implications of Climate Change for National and International Security. Office of the Undersecretary of Defense for Acquisition, Technology, and Logistics, October 2011. Stern, N. 2006. Stern Review on the Economics of Climate Change. Accessed via web on 10/8/2012. http://webarchive.nationalarchives.gov.uk/+/http:/www.hm-treasury.gov.uk/sternreview_index.htm Last updated 7/4/2010. United Nations. 2012. http://www.unhcr.org/pages/49e4a5096.html. Accessed via web on 10/8/2012. The endangered species of the week is the pangolin (photo from www.savepangolins.org), a small (species range from 3 1/2 to 70 lbs), scaly mammal found in southeast Asia and parts of Africa. Also known as scaly anteaters, pangolins use their thick, strong claws and incredible sense of smell to find their primary food of ants and termites. They are nocturnal and secretive. The eight species of pangolins live in many different habitats including forests, thick brush, grasslands, and even cultivated areas. All eight species of pangolin are protected under national and international law, and two of the species are listed as endangered on the IUCN Red List of Threatened Species. It’s unclear how long pangolins live in the wild, but they’ve been known to live up to 20 years in captivity. The major threats to pangolins are habitat loss and illegal hunting for their meat and scales (used in Asian medicine). Want to help with pangolin conservation? Learn more by joining the Pangolin SSC Facebook page at https://www.facebook.com/pages/IUCN-SSC-Pangolin-Specialist-Group/279294488845768, or make a donation toward conservation at http://www.pangolinsg.org/. For more information on pangolins, check out www.savepangolins.org. Pangolin Conservation Support Initiative. 2012. Save Pangolins website. Accessed 10/7/12. www.savepangolins.org. Scardina, J. and J. Flocken. 2011. Wildlife Heroes. Running Press Book Publishers, Philadelphia PA. 264 pp. Anyone who knows me, knows that I don’t need much of an excuse to enjoy dancing. Music in a store, zumba class, kimchi recipes, even an earworm can get me moving. I dance when I cook. I dance when I teach biology. I even have a personal touchdown dance, but have never played football. Not only is this video entertaining, it’s got some really important messages for those of us involved in the environmental movement. Recently, I’ve witnessed several different environmental movements, both local and national, dance into action. Locally, a group called Save Tysons Last Forest has gone from a small grassroots organization to a constituency that’s getting the attention of local and state legislators in their attempt to protect a valuable northern Virginia watershed. The Virginia Sierra Club held a rally this week in Richmond to convince the very politically powerful Dominion Power to increase its renewable energy sources. Across the country, people are joining rallies against unregulated use of fracking technology. All of these movements started with one lone dancer. Is there an environmental movement that your neighborhood needs or is there a movement you’d like to join? If so, the question isn’t whether to start dancing. Of course you should dance! Dance with abandon! The question is, greenmomsters, which type of dancer are you? Split pea soup–it’s doggone good! Here’s an easy split pea soup recipe that I’ve adapted from a recipe found in the February 2012 edition of Family Circle magazine. Not only is it a tasty soup, it uses that hand blender you got for Christmas! Serve the soup with some bread and a salad, and you’ve got a great Friday night meal! I usually double this recipe and freeze what’s left over (which isn’t much in our house). 1) Microwave the veggie bacon strips until they’re crisp. Put aside. 2) Heat olive oil in a large pot. Add onion, carrots, celery, and garlic and saute until the onion is clear. 3) Stir in the peas, vegetable broth, 2 cups of water, and the rosemary. Bring to a boil, then reduce heat and simmer until the peas are soft (at least 40 minutes). 4) Using a hand blender, blend the soup until most of the ingredients are pureed, leaving some of the ingredients chunky. 5) Season with salt and pepper. Crumble veggie bacon strips and add them, cooking for an additional 5-10 minutes. 100 most endangered–are they worth saving? Last month, 8,000 scientists from the Zoological Society of London (photo from Craig Turner, Zoological Society of London) and the IUCN presented a paper at the IUCN World Conservation Congress in South Korea. This paper listed the 100 most endangered species on Earth and discussed whether these species were worth saving. In previous posts, we’ve discussed myths about endangered species, as well as why we should care about specific species that were spotlighted as endangered species of the week. But in a time when conservation groups and charitable organizations try to justify species conservation based on whether the species are valuable to humans, the question of “why save species?” is one worth discussing.